So, I've reviewed a couple of the TomTom devices lately (Spark 3, Touch), and my initial impression wasn't that great. Since the original review, the app has gotten a lot better. But the issue I've always had with any of these things is the multiple silos of data. Ensuring that whatever you use can talk across the multiple storage locations for your activity data, Google Fit, Endomondo, TomTom Sports, MyFitnessPal. Luckily, some of them will work with others, others not. For me, I like having Fit as my central 'hub'. Well the TomTom Sports app took a step closer to working well as now it'll import from Fit data into their app. (personally, I'd prefer it the other way, and I achieve that by syncing TTSports with Endo, and then Endo into Fit). But an app update is an app update, and means it's getting better all the time. See the press release beow. 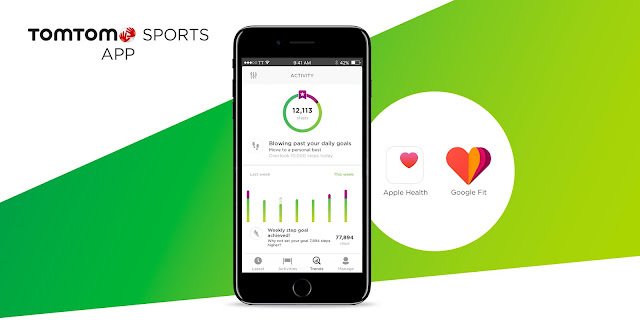 Amsterdam – May 16, 2017 – After the recent launch of the new TomTom Sports app, TomTom (TOM2) today brings an exciting new update to the TomTom Sports app allowing users to import data from Google Fit and Apple Health to their account. As a result, users can continuously track their activity data and see trends, insights and daily summaries in the TomTom Sports app, even without a TomTom Sports wearable. The update allows anyone to import their daily activity data from Google Fit (Android) or Apple Health (iOS). This includes steps, active time, distance and calories. With the TomTom Sports app, they can set goals and get credit for every step even if they are not wearing or using a TomTom Sports device. In case they are connected to Google Fit or Apple Health and wear their TomTom Sports device at the same time, activity data will not be duplicated. The TomTom Sports app, co-created with athletes and fitness app users, gets people going by providing motivational messages, activity trends and comparisons, performance stats down to the second, rich social sharing functions, presented in an attractive and friendly design. To try the app for free, users can download it from the App Store* and Google Play store**, and set up a profile. The app will prompt to connect with Google Fit and Apple Health, as a one-off request. After that, the TomTom Sports app will do the work for you by importing the data on a daily basis. For more information on the full set of features the app provides with TomTom Sports devices, go to tomtom.com/en_ca/sports/sports-app/ or watch the video: https://youtu.be/KoJ5tyJsi7o.